One look at the Seated Half Dollar values and mintage it's a wonder this series hasn't took off! Coin collectors can buy certain dates and mints of Seated halves for near the same price, or less, than a Morgan Silver Dollar and the mintage is lower than 1,000,000. You just can't get a much better deal on silver coins. You can still buy a 1841 date for less than $100 and the mintage is only 310,000. Even when compared to key dates of other coins series this is a low mintage. Very low. 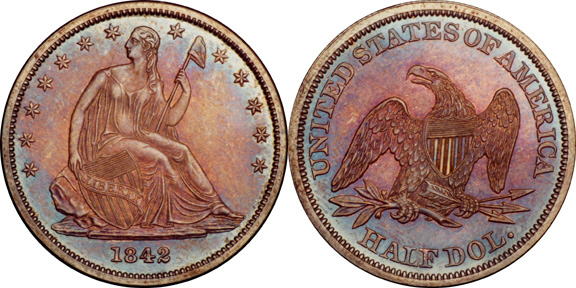 The 1841-O is comparible in both accounts with a mintage of only 401,000 and it can be bought for less than the 1841. Don't get me wrong, higher grade examples sell for much more, and these examples are of lower grade coins, but still an under-valued bargain. 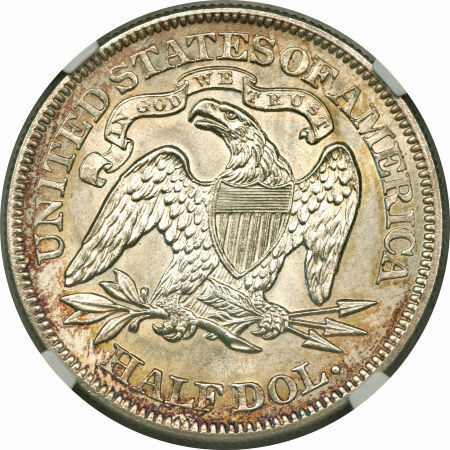 Even considering that the best deals are for the lowest grade examples that just means the Seated Half Dollars series has not reached the full potential of their value. In other words, people haven't caught on to the low grade, low mintage, deals yet. If it ever does then they will be out of reach for most collectors. A couple trends that can change this is the actual survival rate of each date and mint. We already touched on the low mintages but these are just numbers the mint reported they produced, and not how many have survived over the last 100+ The Seated Half Dollar begin in 1839 and that was 174 years ago, and the average life span of a coin in circulation is 28 years. Plus, many silver melts have occured through the years. It's a wonder there's enough to go around considering the facts. Furthermore the 1839 had a mintage of 1,972,400 and that's not key date range but not a high mintage either, so it's stand to reason that out of the less than 2,000,000 mintage much less have survived since 1839. 1839 The variety without drapery at Liberty's elbow is worth 2-10 times the variety with drapery. 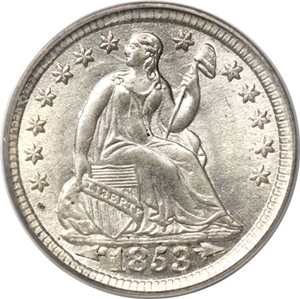 1840 Struck at the New Orleans Mint using a reverse of 1838 without a mint mark. 1842 The date comes in small and medium versions and the reverse comes with small and large letters. 1842-O These come with Small Date and Small Letters (Reverse of 1839) or Medium Date and Large Letters (Reverse of 1842). 1844-O The double date variety has the original date cut way too high into the die. 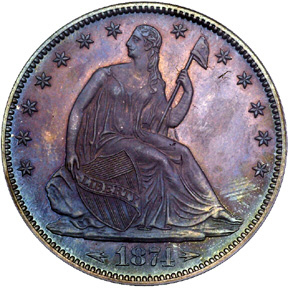 1845-O One scarce variety lacks the drapery at Liberty's elbow because of over polishing of the die. 1846 Look for the rare 1846/5 overdate. Date sizes vary and one interesting variety had the 6 of the date punched into the die horizontally, then corrected. 1846-O Date sizes vary; the "Tall" date is the tougher one. 1847 Look for the very rare 1847/6 overdate. 1853-O None were reported to have been minted. 1855 Look for the rare 1855/1854 overdate. 1861-O Some of these were struck under the auspices of the Confederacy using U.S. dies - unfortunately, there's no way to tell them apart. 1870-CC This is a very rare and popular date. 1873 No Arrowheads at Date. Found with Open and Closed 3's. All of the Proofs are Closed 3's. The Open 3 is extremely rare. 1873-CC No Arrowheads at Date. 1873-S No Arrowheads at Date. 1877 Look for the rare 1887/6 overdate. 1878-S Extremely scarce in all grades. 1873-S No Arrowheads at Date??? ?